Sinem Sal was born in 1989, in İstanbul, Turkey. 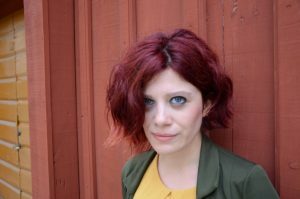 She works as a writer; editor for a literary magazine called and directs the Creative Writing Program in a high school. She is the author of story collection called DANK. She also published three poetry collections: Yine de Âmin, Lakuna and Anekta. Her works have made a tremendous impact in Turkey and they have been translated into German, not published yet. Sal, has written feminist stories and non-fiction works in BirGün Newspaper since 2013. She works as a senior editor in Ot Literary Magazine, which is the most popular culture mag. in Turkey. She has interviewed with so many women who have succeeded to find an inspirational way of power to survive, in spite of the pressure of the society. She is working for her first novel, which will be published in 2018.